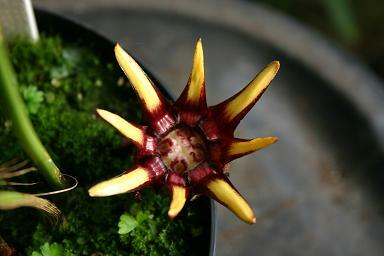 An astonishing Aspidistra that I got from Barracott Plants as A.lurida. It is a plant of the A.patentiloba persuasion, and I will eventually get a proper name sorted out for it, but it's too hot and busy to trouble with now! The flowers are about three inches across! 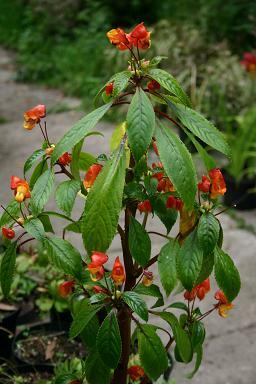 Impatiens (auricoma x bicaudata) . I have a fixation on these strange tender species Impatiens. I keep growing them in spite of the problems overwintering them. I thought for a while that an old plant of I.tuberosa was going to survive in the poly tunnel, but it was mush by march! In august I will take cuttings of them all again, and they will all go back onto the bathroom windowsill for the winter. I have grown a number of the yellow forms of I.auricoma that are being sold as bedding plants, but got bored with them, so they didn't get saved. This hybrid seems to be bigger and shrubbier and worth protecting. Originally grown by Dibleys.